Developing even a basic knowledge of Bahasa Indonesia will dramatically improve your enjoyment of living in Bali or anywhere in Indonesia. It is true Balinese speak Basa Bali to each other, but everyone can speak Indonesian. I would suggest learning Indonesian first and once you have developed some proficiency in the language start learning Balinese. When I first came to Indonesia, I found the Learning Indonesian podcast. I downloaded all of the free lessons to my iPod and would listen to them whenever I went out for a walk, at the gym or while traveling around. When I studied languages before, I usually studied from textbooks. 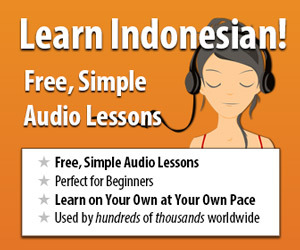 The Learning Indonesian podcast was the first time I studied using only audio. It was amazing how it stuck in my mind. They give you exercises like “How to say this in Indonesian?” And if was alone I would say the sentences out loud. I kept listening to the same podcasts until I memorized the lessons. The free lessons are great, but I can also recommend the paid version. The lessons are longer, enabling you to get deeper into the lessons. I asked Shaun if he didn’t mind giving my readers of this site a special discount. He happily obliged. So if you decide to order the premium product enter the promo code BALIEXPAT to get 20 per cent discount. Attending language classes can be a struggle. Also finding a good teacher and then trying to arrange times to meet every week is never easy. Thanks though to the internet you can find great teachers online and do the lessons online over Skype. Preply is a great service and there are many Indonesian teachers all over the country as well as some in Bali. Lessons can start as low as US$3 an hour. Even at a reasonable US$10 an hour, it is very affordable and you don’t have to make any long term commitments. Preply of course is not just for Indonesian teachers, you can find language teachers for just about any language. Click on the banner below to sign up and get a 30% discount.